The start-up company was founded in 2005, by a team of researchers including Jean-Marie Lehn, a Nobel laureate in chemistry and Bruno Pitard from Nantes University (CNRS 6291 / Inserm1087), who began his career at Sanofi. The company carries on with its growth, while maintaining its local base. After 10 years, the company is still owned by its founders, and is seeking between 3 and 4 million euros in order to produce innovative vaccines using its Nanotaxi® technology *. 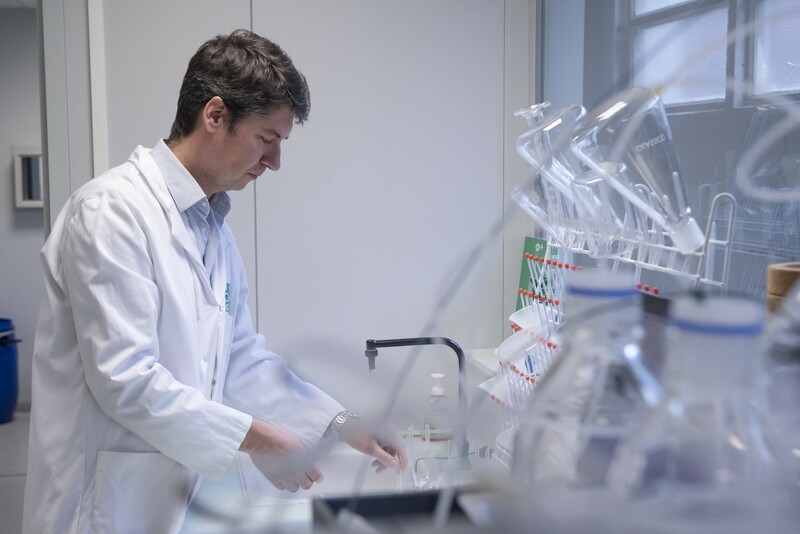 The Hépavac project -Laureate of the 11th Unique Inter-ministerial Fund- and which is a demonstrator for the production of innovative vaccines, stimulates the company to move forward. In 2017, this vaccine against liver cancer is ready to be tested on humans. It is at the stage of the toxicity regulatory study for this phase 1. The production is subcontracted to manufacturers of the pharmaceutical industry, who possess the authorizations for the molecules syntheses for the treatment of humans. Over the past 10 years, the company has focused on the sale of reagents (ICAfectin®), new antibody discovery services (ICAntibodies ™) for companies and researchers both in France and around the world. This service activity, which funded R & D during this period, is particularly concentrated on the development of vaccines and innovative therapeutic products, with the aim of making them less costly to produce and better targeted for patients. In Cell Art is now focussing on this activity. With about ten partners, In Cell Art works on vaccines against Zika, HIV, melanoma, cervical cancer, ETC lung cancer and, with Sanofi-Pasteur, Curevac and the US Defense Advanced Research Project Agency (DAPRA), on a vaccine against infectious diseases, based on messenger RNA. “Over the last ten years, Nanotaxi® technology has been developed and brought to the doorstep of “human beings”. The Nanotaxi® and the active DNA which are to be delivered, are produced in GMP quality conditions and then distributed in flasks. These subcontracted steps are very expensive. This validation trial in humans is essential to confirm the interest of future customers in using Nanotaxi® technology to develop their vaccines or therapeutic products on a licensing model. To that end, In cell Art is seeking between 3 and 4 million euros.” says Bruno Pitard. “All this development would not have been possible without this anchor here in Nantes,” Bruno continues. Supported by a number of local players such as the Pays de la Loire Region, Nantes Métropole, the General Council, BPI, he also cites scientific partners in this development, notably Nantes University, INSERM, the University Hospital Institute at the level of collaborative projects and Ose Immunotherapeutics for the Efficace project (supported by the State and the Pays de Loire Region). A project in which the patient will become the producer of his own monoclonal therapeutic antibody through the Nanotaxi® technology. Not to mention the connections made possible via Atlanpole Biotherapies cluster’ actions . For example, the Belgian partner to whom In Cell Art subcontracts the regulatory part of their activity, was presented to them in the context of a program of the cluster (In2LifeScience)! In several diseases such as cystic fibrosis, Duchenne myopathy etc., there is a malfunction in the cells. To counter it, DNA or functional RNA have to be brought in, so that the cells can produce the right proteins. But DNA – RNA does not naturally cross the cell membrane. So vectors are needed to deliver them into the cells. It is here that In Cell Art therapeutic innovative technology comes into its own: the Nanotaxi®, which have the ability to deliver the macro-biological molecules into the cells. Unlike current treatments, which are using small chemical molecules, in the Nanotaxi® technology, the patient himself will produce the therapeutic macromolecule he needs.